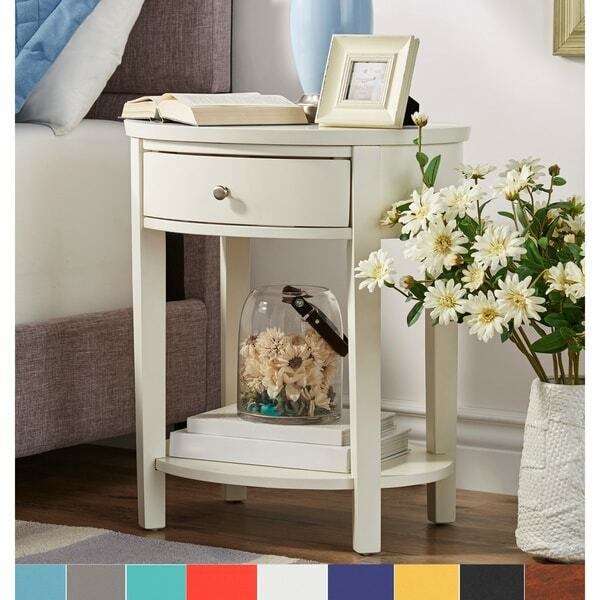 This is so cute and the perfect nightstand for by daughter! Complete your casual living room seating area with the Filmore accent end table from iNSPIRE Q® Bold. Boasting a single spacious drawer and an integrated bottom shelf, this table offers convenient storage space for remote controls and personal electronic devices. Use the table's top to display a favorite vase or decorative lamp. With its oval shape, this accent table fits neatly next to a sofa, loveseat, or armchair. Crafted from poplar wood with French dovetail construction, this piece delivers years of use. Wood glides allow for effortless opening and closing of the drawer for added convenience. Infusing contemporary elements with daring hues, shimmering metallic finishes and an eclectic air, iQ Bold is for the free-spirited trend setter. Offering beautiful and unexpected intersections of styles, textures and colors, youll find pieces that express your unique personality. iQ Bold is sure to inspire beautiful designs with a fresh twist on current trends. ELEGANT without being overpriced ! Elegant without the high price...I always read reviews on products that I am considering, especially with furniture or any large item. I had been looking for nightstands that were elegant, but not overpriced. I finally made the purchase and received them today...To say I'm pleased would be an understatement. The are elegant, and the quality is a "10" for the price. The assembly was a breeze and I was done with both nightstands within 30 minutes. You put the legs on and then the bottom tray, be sure to follow the instructions, which state "put 3 of the legs on " and then the bottom shelf, then the 4th leg. 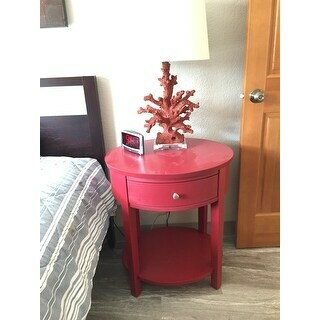 LOVE LOVE LOVE these nightstands. Inspire Q is where it's at! I haven't ordered a single thing from Inspire Q that I haven't been pleased with and these tables are included. The color is bright and vibrant and assemble was a snap. Beautiful piece, easy to assemble. I was looking for a small bedside table with a drawer. This is perfect. It is quality wood, was easy to assemble and is very sturdy. Product well priced. Well constructed, easy to assemble. I have purchased INSPIRE furniture previously. Same experience. I loved the design and the unique oval shape of the end table, which we used as night stands. One arrived in perfect condition. The other had a scratch on the front which wasn't obvious unless you were looking for it. It was in "Espresso" so perhaps easier to see against the dark stain? We got good use out of them and they held up well for several years. When we moved, we sold them. We liked them a lot but not loved enough to travel across the country. Drawers were large and roomy, and the shelf below we used for books or accent pieces. I purchased this to sit next to a small reclining chair. It was easy to assemble and looks very attractive. Only complaint is that the drawer does not appear to fit properly. It opens and closes easily but one edge of the drawer is not flush with the table frame when the drawer is closed. Wood finish is very good. I purchased two of these tables to use a nightstands in the master bedroom. They are a great value. I wanted something that was not too bulky or heavy looking, but still provided some storage. My main complaint is that the drawer is difficult to slide and can cause the table to jostle when you pull on it. I bought two of these as night stands for my bedroom. They were easy to put together. They look great and I like that it's open on the bottom with a shelf for stacking books or whatever. Makes my bedroom look a bit more open. The wood does feel a bit cheap and like it would be easily scratched. They are very light tables and also a little bit wobbly (with no way to adjust). I wouldn't place hot/cold glasses or anything like that on them without a coaster. I purchased both in black, also, and the black isn't completely black - kind of more of a charcoal. The color hasn't been an issue for me though; I'm more concerned with the quality of the wood. A lot of people commented on the drawer not being so great and while I don't regularly open and close mine, I can definitely see how they might eventually jam. There are no metal parts in the drawers, so they do NOT slide out smoothly. Something to consider. They also don't really hold a lot, so be aware. Overall, I'm not 100% sure I would purchase again. They do look nice and I had something very specific in mind when I set out to buy night stands, so they fit the bill for the most part. I would just prefer something a bit sturdier. Purchased two in espresso for my living room. Drawers are small, so watch dimensions, but perfect for my charger cord and remote control. Sturdy construction and very nice finish. Very pleased with these tables. Nice nightstand for the bedroom. I have only had it for a short while but it is sturdy and the top is very roomy. The drawer is small but large enough for glasses and small stuff. I love the rounded edges and it is taller than most nightstands so it is easy to reach and see what's on top. I am pleased, especially because of the price. The tables are almost exactly what I was expecting. I based my order on the color in the picture, not the name. When I think of espresso, I think of a dark finish, almost black. These were definitely more reddish and lighter which is what I was looking for. I was surprised at how lightweight the tables are. They are so light that they don't balance completely on the carpet. I put heavy books in the drawer of each as they were quite wobbly on the carpet. That being said -- very pretty tables and for the money, seem to be good quality. I wanted something cheap so I didn't expect them to be the greatest tables in the world. Nice table for the price! Very simple to put it together --only took about 20 min and it was nice because really you only had to put the legs and shelf on. The main top part with the drawer is already assembled! Actually a very decent and well made table for the price, heavy and seems to be very durable. I ordered the turquoise one and it really is the same color as pictured. 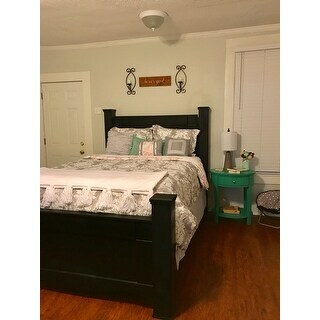 It looks perfect in my guest room, I love it! I previously bought 2 gray ones for a vaca home. Easy to put together great value for the price. I bought 2 'yellow' ones for my main home. Redoing the master bedroom in different colors. This is NOT the yellow pictured. I took a picture yet it still does not represent the true color which is more of a golden rod/orangish yellow. I ordered 2 sky blue ones as replacements. I called O customer service and thankfully they agreed to pay return shipping (they weigh a lot and would have cost a lot to return) the gal that helped me was very nice and understanding. Easy return too with UPS picking them at my home. I ordered the red table. It is a great color, just what I wanted. The table was easy to assemble. Despite having read the dimensions before buying it, I was surprised at how large the table is. It is a heavy, solid wood, well made table. This table assembles without much trouble and all the pieces fit together well. The finished table looks nice and feels solid. It looks nice with a pretty lamp on it in my small guest bedroom. The price for this product seems about right for the overall quality of the product and that fact that you have some assembling to o. Got this to use in the spare bedroom as a second night stand. The color is sort of a pinkish red which for that room is absolutely perfect. Great little end table. Just right for the bedroom. I purchased two as nightstands for the guest room and they have held up great for the past 3 years. They were very easy to put together and look great. Loved this table, looks great in my sun room, easy to put together and very beautiful. We use these for a guest room. They look great and are well built - not flimsy at all. They've held up well and get compliments all the time. Its a pretty table and easy to assemble. Unfortunately the drawer is so hard to pull open, to open you have to hold down the table! I have contacted overstock and I’m waiting for them to send a new top. For the price, it's very nice. 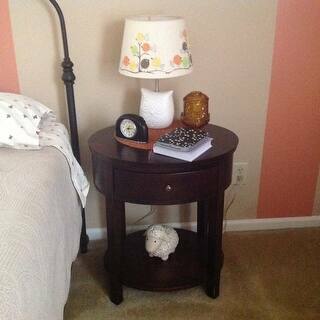 I love these end tables for my smaller bedroom. They fit nicely by the bed and are very stylish. While there is some assembly, they are sturdy and well-made. Please note this does not come assembled, therefore requires full assembly. For more information please go to https://help.overstock.com/help/s/ for help on returns and other information. Thank you! "What is the overall width?" The width is 23.8 inches and the depth is 20 inches. "I'm looking at this item in the espresso finish but don't see that as an option to select when purchasing. Is it out of stock? If so, is there an expected availabililty date?" It is expected to be back in stock in early June. 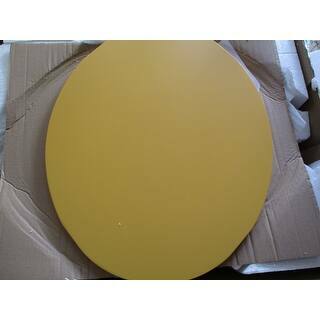 "I am looking for a cream colored table. Is this white closer to a true white? I really do not want white but it is difficult finding cream at this time." I would describe the white option as a true white. "Is the color pictured white? Or is it an off-white?" This table features an off white color. "I wanted to put a CD player on shelf so need to determine dimensions inside the legs for bottom table? My player is 17" wide and 18" deep." The space between the legs is 13.3 inches wide x 17.8 inches deep, so unfortunately your CD player will not fit. "I do not see white as an option. When will white be available? " The white option is currently out of stock. It is expected to be back in stock in mid-February.